OK. THAT was a great day. Its December in Massachusetts. Its cold out. Its gray and dreary and bleak. The playground is a huge expanse of semi-frozen mud, all of which clings to the shoes of my students and transfers itself to my classroom. The kids have colds. They are tired, they are coughing, the faucet flow of ten year old noses has no end. I am the queen of sanitary tissue disposal. We’ve had freezing fog, for God’s sake. The roads, the leaves, the walkways, my windshield, all frozen and slick and unlovely. I am in a dead-of-winter mood, and it isn’t fun. It also isn’t even winter. We have a seriously long spell of this crap ahead of us. When I fall into these moods, I lose all sense of reality, and I begin to believe that nothing will ever change. I start to think that every day of my life has been this gray and cold. I start to believe that every day of my life will continue to be this gray and cold and bleak and grim. When I fall into these moods, I become convinced that freezing fog is the hallmark of my life; it seems to me then that I have never been warm, and never will be warm again. So you can imagine my surprise and delight when I scrolled through a series of old photos, and found this one of me. 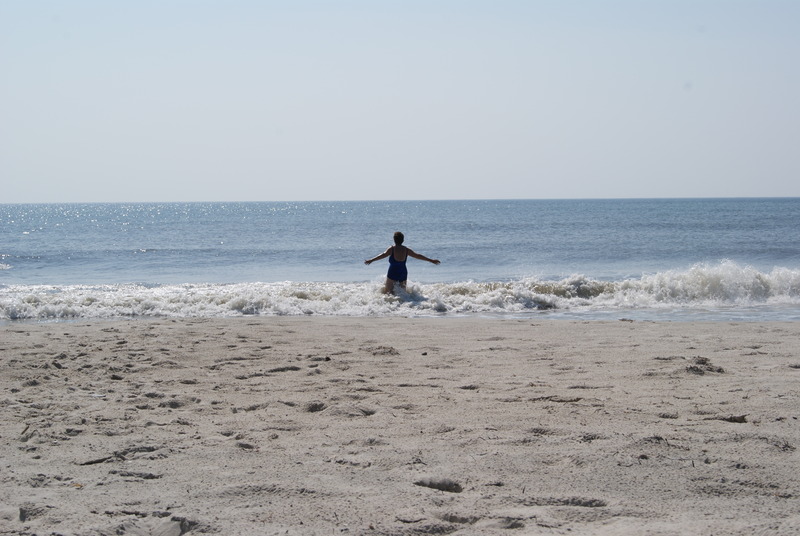 It was a few summer ago, and I was camping on the beautiful beaches of Assateague Island with my daughter, Kate. We had nothing to do except swim and read and sleep. We had nowhere to be except the water’s edge. I remember that the beach that day was nearly empty. The sky was a perfect blue, and the sun was so bright that it looked like a fantasy. The water was welcoming and safe, and just cool enough to soothe our sun drenched skin. I walked into the surf and spread my arms to embrace the perfect warmth of the moment. I breathed in the salt, sank into the waves, floated in absolute peace until I felt myself to be a creature of the sea. OK. So I guess that life does have its moments. Because THAT was a really, truly, great day. I know how you feel. I’m planning on surfing in nyc on 1/1/14 to shake it off. Wait, what??? Surfing? On slush, I presume?? Perhaps you could somehow take this picture & place it strategically in various places just to remind yourself of this wonderful day went winter gets you down:) One on your bathroom mirror, one on the dash of your car (perhaps on a bobblehead to make you smile), one in your classroom. Summer will come again, I promise:) Hope tomorrow is better! Ah, Lynn, that would be such a great idea if the photo was of a younger, slimmer me! I sort of cringe when I see it, even though that totally was the BEST day! Bah, just focus on the BEST part! We worry way too much about how our bodies have changed with age! Where are you in Massachusetts? We are south central, very close to Woonsocket RI. We are way north of you! North Central, on the NH border! Close to Jaffrey and Rindge NH. I want that day with you! When I redo, you are so. there.! And that’s what will keep us going till spring! Amen to that! My students asked me why my desktop photo is “always some beach”. Really? They’re wondering why? Every time you talk about your camping spot, with the ocean and the horses, I long to be there too. It sounds like such a beautiful, peaceful and magical spot.